Crazy Color Hair Dye There are 72 products. You're sure to attract all the attention with this voluptuous and beautiful shade of Crazy Color Semi-Permanent Hair Dye in Cyclamen Red! If you’re planning a new alternative hair style, you’ll be in safe hands with Crazy Color hair dye! These high quality, vibrant products come in a whole rainbow of colors, so you are sure to find the shade that is perfect for you. The famous brand was launched in 1977 amidst a funky punk rock era of jazzy hair and wild dye styles. Through the years the Crazy Color hair dye brands has stayed true to their roots by ensuring the iconic mini pink bottles are always filled with the boldest and brightest stand-out colors. 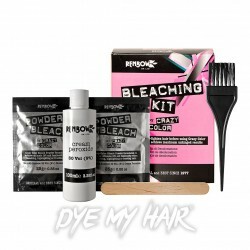 Here at Dye My Hair, we have plenty Crazy Color hair color to keep you looking your absolute best and keep you experimenting with awesome new styles. We have a huge range of bright colors in our Crazy Color selection. Each pink bottle comes with 100ml of semi permanent hair dye which lasts for up to 6-8 washes. These unusual colors are the perfect way of notching up an awesome temporary look. If you’re searching for a new commitment-free look, then these dyes will be the perfect selection for you! From a background of pure punk, it’s fair to say that Crazy Color have a load of vibrant and bold shades on offer. We’ve grouped all of our favourites to give you this Crazy Color hair dye review. We are certain these colors will make your hair look a whole new shade of fantastic. Blue – with shades such as capri blue hair dye and Sky Blue, you’ll be falling deeply in love with these rich Crazy Color tones. You could indulge in a Bubblegum Blue, Peacock Blue or Blue Jade if you searching for a lighter shade of turquoise. Red – The fiery shades of Fire Red, Coral Red and Vermillion Red are all awesome ways of showing off your bubbly and fierce personality. Alternatively the sophisticated looks of Ruby Rouge, Cyclamen Red, Bordeaux Red or Burgundy are certain to give you the refined and retro vibe that you’ve been looking for! Pink – Be pretty in pink with these shades of Crazy Color pink that are sure to make any look pop! Unleash your inner rock chick with a daring shade of Pinkissimo or choose cute shades of Candy Floss or Marshmallow Pink for that sweet hair dye finish. Silver – everyone loves a metallic shade of hair dye, and the Crazy Color silver hair dye range is no exception. With funky shades of Platinum and Silver hair dye, you’ll be up to date with the latest styles in no time! Many people are also looking for graphite gray colors. You may be asking ‘what color is graphite gray?’ It is simply a slightly darker shade of silver! This is only a small selection of the awesome Renbow color chart of colors available in Crazy Color hair dye! There’s plenty more exciting colors from deep purples to delicate lilacs, emerald greens to canary yellows and bright oranges to bold black shades. Whatever section of the rainbow you are aiming for, you’ll be sure to find the ideal shade for you. Peroxide Free – when used in high quantities, hair dyes which contain peroxide can be very damaging to the hair. It can sometimes have a corrosive effect which leaves the hair damaged and weakened after dyeing. Being peroxide free, these dyes are sure to keep your hair healthy. Alcohol-Free – in hair dyes, alcohol can be useful during the dye absorption process as an evaporating tool. If used in excess, hair can be dried out after dyeing. Crazy Color dyes ensure the hair is kept hydrated during and after the dyeing process. Ammonia Free – hair dyes which contain ammonia break through the hair to the central hair shafts. Although this causes the dye to last longer, it can cause damage to hair, making it rough, brittle and easier to have split ends. As Crazy Color dyes are ammonia free, your hair will look amazing whilst staying in top condition. Not Tested On Animals – it is very important that products are sourced and tested ethically. Crazy Color’s hair dyes and products are made from ingredients which are not tested on animals and are entirely cruelty-free. You’ll have to agree, that when it comes to minute details, Crazy Color have considered everything. There are plenty of unusual colors paired with high quality products that will certainly care for your hair in a multitude of ways! They even have the coolest creative rainbow color name! At Dye My Hair, you’ve certainly come to the right place to pick up some awesome Crazy Color hair dyes! We stock a whole rainbow of colors that will make a crazy change to your hairstyle. When shopping online with us, you can not only pick up a single 100ml bottle, but also multipacks of four bottles. These rainbow hair dye pack are perfect if you’ve found your perfect shade and want to make your new look last a whole lot longer. If you’re still experimenting with colors, then the semi-permanent hair dyes are perfect if you want to constantly switch things up. The hardest choice is up to you – which shade of Crazy Color hair dye will you try next! You could even get creative and try out a rainbow or two one effect. It is easy to achieve a huge range of styles at home and with all these bright colors available we know you will soon be coming back for more!